The attribute of God by which God perfectly and eternally knows all things which can be known, past, present, and future. God knows how best to attain His desired ends. There is nothing that lies outside its scope. Nothing can possibly happen to us that God does not already know and has not known eternally. And that includes every trial we face in the course of a lifetime. The Bible is filled with details of God’s knowledge. For example, He knows the number and names of all the stars (Psalm 147:4). He knows every sparrow (Matthew 10:29). He knows every bird of the mountains and every wild beast in the fields (Psalm 50:11). But most important of all, He knows us and everything about us. The classic passage on that subject is Psalm 139. David assured us that God knows when we sit down and when we stand up (verse 2). He knows our thoughts before we think them, while they are far away from us (verse 2; cf. also Ezekiel 11:5). 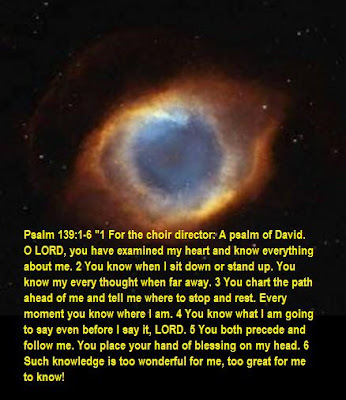 He knows all our ways (Psalm 139:3), a word referring to the whole course and conduct of our lives. In other words, He knows everything that we do (cf. also Job 23:10; Proverbs 5:21; Jeremiah 16:7). He knows every word we speak while it is still on our tongues, before it ever comes out of our mouths (Psalm 139:4). Jesus told us that the Father even knows how many hairs we have on our head (Matthew 10:30). There is no way that we can possibly keep any secrets from Him (Psalm 44:21). God knows everything that goes on in our hearts and minds. One of the last things David did before he died was to give this charge to his son Solomon: “As for you, my son Solo­mon, know the God of your father, and serve Him with a whole heart and a willing mind; for the LORD searches all hearts, and understands every intent of the thoughts” (1 Chron­icles 28:9). Since there are no secrets with God we might as well face the fact that there is no such thing as a secret sin. “Thou hast placed our iniquities before Thee, Our secret sins in the light of Thy presence” (Psalm 90:8). The writer to the Hebrews agreed with him. “And there is no creature hidden from His sight, but all things are open and laid bare to the eyes of Him with whom we have to do” (Hebrews 4:13). He never gets fooled. He knows everything about us. If God knows everything then He obviously knows our future, and Scripture bears that out. He knows “what is to come” (John 16:13), and “the things which must shortly take place” (Revelation 1:1). He knows “the end from the beginning” (Isaiah 46:10), that is, He has known how things will turn out since before time began. That includes a personal knowledge of our lives. For instance, He knew before Jeremiah was formed in his mother’s womb that he would be a prophet to the nations (Jeremiah 1:5). He knew before Paul was born that he would preach Christ among the Gentiles (Galatians 1:15-16). He knows everything because everything that happens is part of His perfect plan (Ephesians 1:11). He has included in that plan from eternity past all the choices He knew we would make of our own decision. Nobody taught God what He knows. He never had to go to school to learn. He knows simply because of who He is. The obvious answer to those questions is “no one!” He knows everything by the very essence of His being. An infinite God must possess infinite knowledge as a necessary part of His nature. When Paul thought about that, it caused him to exclaim, “Oh, the depth of the riches both of the wisdom and knowledge of God! How unsearchable are His judgments and unfathomable His ways! For WHO HAS KNOWN THE MIND OF THE LORD, OR WHO BECAME HIS COUNSELOR?” (Romans 11:33-34) What a magnificent God we know! God knows everything that has happened and everything that will happen. He knows when we do things for the wrong reasons and when we do things for the right reasons. All things we do should be to serve Him and bring glory to Him. Since God knows everything I do and the reasons or motives I have for doing them, I will commit myself to doing everything as if I were doing it for God Himself. I will yield myself to Him daily, that I may do what He wants me to do and be what He wants me to be. There is no need to compare ourselves with others. God merely wants us to use what we are now and what we . God understands us better than we understand ourselves and He is right there to minis­ter to us with the appropriate encouragement and the perfect provision. He does that today through His Word. Do you have a need that you yourself may not fully understand? Turn to the Scriptures and allow the omniscient Lord who inspired them and who revealed Himself through them to minister to your need. There is only one thing that God blots out of His knowl­edge, and that is our sins. He said, “for I will forgive their iniquity, and their sin I will remember no more” (Jeremiah 31:34). That is a blessed promise for every true child of God. God knows whether or not we are truly His children. On several occasions the Lord Jesus demonstrated His penetrating knowledge of people who had professed to believe on Him but whose commitment was not sincere (John 2:23‑25; 6:64). He knows the same thing about us. If you have never genuinely acknowledged your sin and trusted Him for for­giveness, do it now. He will blot every sin you ever committed forever from His memory. List some of the things you are glad that God knows about you that other people may not know. Try to remember that He knows them when you are feeling misunderstood or falsely judged. List some of the things you wish God did not know about. Determine now that by His grace you are going to change them. Confess them to the Lord and commit to not do them again. For Thursday: Share with us what you are thankful for regarding the two attributes we have discussed the past two days. It's funny but once again your post relates so wonderfully to mine in one way...mine talks of how God removes the stain of our sin- not only the sin, and you talk of how God does not remember our sins...It is hard to imagine how one can not only know everything there is to know ALWAYS, but literally BE wisdom. "By wisdom He laid the foundations of the earth..." Christ, the wisdom of God and the power of God...God IS wisdom! Wow! Great post. Loved all the scriptures! I loved your first scripture and picture...so fitting. I think it is awesome that God is all knowing. How powerful He is...I can rest knowing that He has everything under control because He knows the plans He has for me. Awesome! Isn't it a comfort that we can trust God's power and control in our lives? 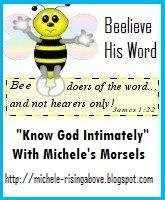 Great post, Michele! Great pic, too! Wonderful post. Thanks for sharing. I loved the photo of the white house and the verse. Once again, wonderful teaching. Thanks, sis. Love you. I am so far behind with posts....sorry. In a way I am so glad that God knows everything about me....there is at least one "person" I don't have to worry about letting down. Of course there are things that I wish He had never seen...things I wish I had never done...I know they hurt Him so. And so I am glad that He remembers them no more.